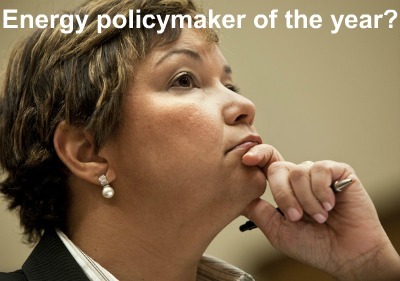 Tomorrow night, Politico will name EPA Administrator Lisa Jackson as the most influential energy policymaker of the year, presumably for implementing a regulatory train wreck that will certainly make energy more expensive, and perhaps even turn out the lights. What? Was the president of the Sierra Club unavailable? I am fed up with environmental over-kill, its drag on the economy and its interference with our personal liberty. Lisa Jackson is a disaster waiting to happen. I would be interested to know her qualifications, probably no better than Obama himself. Her ruling as pollution on the vitally necessary gas CO2 as air pollution is a boo-boo of the first order. Not only is CO2 vital to our food supply but a robust supply is required in our greenhouse gases as the only thing standing in the way of the Earth becoming a lifeless Ice Ball. This is why ignorant political appointees can be dangerous to all of us and why the Environmental religion needs science oversight. This is why I believe the EPA needs defunding and it would also help our bottom line.